View the latest version of this manual online at http://mindprod.com/application/bulk.manual.html. Charities, churches and clubs need to broadcast email notices to all their members. Typical tools for doing this are hard to use. They are designed primarily for spammers rather than for those with a legitimate need to send bulk emails. Email programs like Eudora are not designed to work with large mailing lists. It is tedious breaking the lists up into bite size pieces for them. In contrast, the CMP (Canadian Mind Products) bulk emailer was primarily designed to be easy to use. The emails that arrive to your subscribers looking as if they had been individually addressed in the TO: field. They may be formatted (HTML (Hypertext Markup Language)) or plain. They might contain embedded images. They might include attachments. However, the emails are not customised in any way. Everyone gets exactly the same message. There is no customising the message for each recipient, other than the TO: field. Subscribers cannot see the names of any other subscribers. Unlike a BCC:, they see themselves as the primary recipient of the message. You can use any email program you are familiar with to the prepare the bulk email. You don’t have to learn a new tool. You can use any of the fancy features of your mail program including fonts, colours, sizes, pictures and enclosures. It can fairly easily integrate into your existing database. It does not insist you learn a new program to track your clients. Every email looks to the end user as if you had individually sent it only to them. You don’t have to set up, configure and manage a complicated local mail server, though you can if you want super speed. You don’t have to configure anything. CMP does that for you and will talk you through the setup. You don’t need to be a computer whiz to use the program. The program does an exhaustive series of checks on email addresses before actually sending the emails. This means you get fewer bounced emails. You don’t need to rent space on a web server. 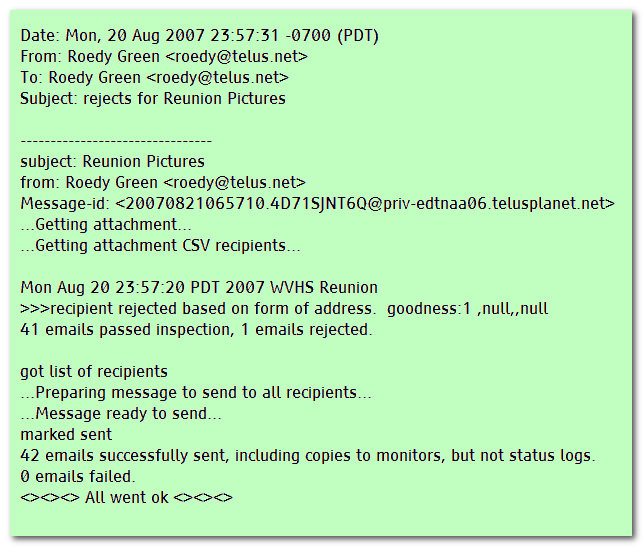 The bulk emailer is connected to the Internet only when it is sending emails. The CMP Bulk Emailer is not a ListServ. Subscribers cannot add or remove themselves from the list. If you need that ability, see the ListServ Software Vendors. With the CMP Bulk Emailer there is no way to customise each email to the recipient, e.g. inserting their subscription expiry date. The CMP Bulk Emailer is not suitable for lists of hundreds of thousands of people. It is designed for small lists, e.g. club memberships or lists of newspapers or lists of politicians not spamming. Because it normally uses a remote mailserver, it is not particularly fast. The CMP Bulk Emailer does not come with a database. You either have to get me to write you one or you have to use one you get elsewhere, or you have to do something Mickey Mouse with a word processor or spread sheet. and is considerably more complex to manage. To send a bulk email, compose your email exactly as you would send it to an individual. It can be formatted or not. It can have colours and fonts It must have a subject. It can have embedded pictures. It can be plain, or styled (with HTML ) or both. It can have attachments. Use whatever tool you are familiar with to create the email, e.g. Eudora, Opera, Outlook, Pegasus, Pine, Polarbar, SeaMonkey, Thunderbird, etc. You can even use a WebMail program such as HotMail. Use any of the fancy features you please. Create a list of email addresses and names you want this mail sent to. You might use a simple Abundance database to do this, or you might create it with a word processor, or you might export it from your client database. [Abundance is just a computer language for writing database applications with extensive validation of data. It is relevant only if you don’t already have a database.] You database should give you the ability to select the people by various criteria to spin off to send a letter to. mayor@city.victoria.bc.ca is the email address. Mayor Allan Lowe is the person’s full name. This is useful if you get a reject to figure out which person it was. 0001 is the optional account number if you have a database with account numbers. It too is useful it tracking rejects. You then attach the list to your email. Then you send the message to an email account reserved for accepting bulk email to be relayed, e.g. bulk@mydomain.com. In theory, you could send it to yourself, but having special reserved account for bulk emails is simpler. You will get an email back from the bulk emailer about rejects. Make sure you research them and fix the database. You may also get a few individually bounced emails back later. They too need to be researched and corrected. If you are nervous, you can do a test run first, that sends only a copy back to you, by putting don’t send as the subject. To use with the Eudora email program, compose the bulk email as if you were going to send it to an individual recipient. You can use any of the fancy formatting features such as colour, bold, type sizes and italic. Address it to the special bulk account, e.g. bulk@myisp.com. Right click Attach file and specify the name of the file listing the email addresses of the recipients, usually produced by an abundance program, e.g. C:\CIV\LIVE\EMAILS.TXT. Then type click the STARTBULK icon. After all the emails have been sent, click the STOPBULK icon. If for any reason your computer or the program should crash during a bulk mail run, you will have to type CLEARBULK to reset it. To be very safe, you might want to manually read the mail you sent to the bulk email account, to clear the queue of work, figure out just what was sent and then resend what was not. Without that step, it should recover fine, with some possibility of sending some messages twice. a month from almost any ISP (Internet Service Provider) on the planet. I would recommend renting the locally for better phone support and for getting help from friends already familiar with their peculiarities. You also need a decent email program for creating the emails. I suggest Eudora. It lets you create many special effects including adding pictures, coloured text, varying fonts and sizes of text. You can download a free copy from Eudora.com. If you are already using Outlook you could continue to use that, though I would strongly recommend against it since it is so prone to spreading viruses and worms. If you are unfamiliar with computers, it will be much easier on you if you find someone locally, not necessarily a computer expert, who has set up email accounts and email software before. Once you have the two email accounts set up and working with Eudora, it is relatively easy to get the Bulk Emailer working after that. You need a Pentium/AMD class PC (Personal Computer) or better, capable of running Java. I would recommend having 1 GB or more of RAM (Random Access Memory). You are not limited to running on W2K, XP, W2003, Vista, W2008, W7-32, W7-64, W8-32, W8-64, W2012, W10-32 and W10-64 machines, though it will be simpler if you are. The bulk emailer will run on anything that supports Java version 1.6 or later and JavaMail, e.g. Linux. You can get a jump start on checking out the suitability of your machine by installing java and seeing if you can run the Biorhythms Applet. This Java application needs 32-bit or 64-bit Java 1.8 or later. For best results use the latest 1.8.0_131 Java. If the above application does not work, check the Java console for error messages. If the above application does not work, you might have better luck with the downloadable version available below. If you can’t get the above application working after trying the advice above and from the red HELP button below, have bugs to report or ideas to improve the program or its documentation, please send me an email at . If you send out thousands of emails, your ISP (Internet Service Provider) might start complaining. He may impose a quota. One way around this is to do the mailing in batches. Let us say you were signed up with shaw.ca who puts a limit of 1000 outgoing emails per day on all business accounts. Let’s say you had under 300 emails going out as part of your normal traffic. That leaves you 700 to use for bulk emails. You split your mailing into batches of 700. It might take you several days to get your bulk mailing out that way. If you prepare you mail list with an Abundance program, you would use the pages feature to select the correct batch. If anyone complains about your emails as spam, even if they deliberately asked for them, your ISP may shut you down. So you want to check with your ISP first that they won’t mind what you plan to do and they won’t block you. What are you options if your ordinary email provider is not suitable? You can search with Google for bulk email hosting for ISPs (Internet Service Providers) happy to take your bulk email business. If you are more adventurous, you can set up you own email server, in effect, become a miniature ISP and handle your own mail sending. You would need to run the email server software all the time so that it could both resend failed emails and accept rejects. This is considerably more of a technical challenge that running the bulk emailer. The advantage of the mailserver approach is it runs faster, since ordinary ISPs put a choke on the mail to keep the flow to a dull roar. The bottleneck in using the bulk emailer is the speed at which the mail server accepts mail to send. The disadvantage is the mail server approach is more complicated since you have to buy, install, configure and maintain an email server. Even with your own server, your ISP connection provider might field complaints about your emails and shut you down. When you use a hosting service who is bulk email-friendly that is not a problem. Complaints usually go to the mail provider, not your connection provider. Telus blocks outgoing SMTP (Simple Mail Transfer Protocol) port 25 traffic. This discourages Telus customers from having email accounts on other servers. This would be a problem if the Telus email account itself had too onerous a quota. Bulk itself does not absolutely require SMTP 25 access to other than one email account, though it does need it for the optional mailserver validation. Further, though a private mail server used to greatly speed mailing up, would require SMTP 25 access to outside servers. The key is to be upfront with your ISP and your email provider about what you plan do, telling them just how many bulk emails you plan to send each day to make sure they have no objections. Otherwise they will interfere and block you in many ways defeating the purpose of the program. They are often concerned that you might up to some sort of spamming. When you order the program, I burn into it various facts about you, such as the names of the email accounts you want to authorise to use your bulk mailer and the names your email servers. When the program arrives, it is 100% ready to go. There is nothing for you to configure. I will work with you until you are successful. The email account, login and password you want to use for relaying bulk mail. The list of people who are authorised to use the program. The name of your mailserver. This information all goes in a Java class called CustConfig.java. The program is written in Java, so part of the installation process requires installing the Java runtime, which can then be used for any Java programs. There is no extra cost for this, just extra steps in the installation process. To make the program work, normally you would hire me to together custom configure a piece of the program that looks something like this: I will guide you to prod your mail provider to give us the information we need to set this up. If you have some experience with email setup and Java programming, you can configure and recompile yourself. You must reconfigure, rebuild (recompile the Java source and recreate the jar). Just configuring the CustConfig.java file is not sufficient. The bulk emailer itself free. The bulk emailer itself is free. If you are a programmer or have a friend who is, you can probably set it up yourself without my help. for coaching you through installation and your first few emails. It would let you maintain a list of all your members and select out groups of them based on targets, e.g. for a church you might have a target for choir members, another for board members, another for large contributors, another for people who volunteer for bingo night, etc. You specify which targets you want to include in any given mailing. Some active members many on be ten different targets, but they will still get the mailing only once. We would have a discussion about your needs and I could give you a firm price quotation for any custom work. Send an email to . for the current version of Bulk Emailer. Simple bulk emailer to broadcast emails for charities, churches and clubs. 645K zip for Bulk Emailer Java source, compiled class files, jar and documentation to run on your own machine as an application. access bulk source in repository with [Tortoise] Subversion client on wush.net/svn/mindprod/com/mindprod/bulk/. download ASP PAD XML program description for the current version of Bulk Emailer. Bulk Emailer is free. You are free to use the program as-is without payment. However, it requires programming skill to configuration. The fee is for my time to customise the program for you and help you install it. Check out the prerequisites carefully and email me to discuss your needs before you buy. Non-military use only.